Introducing the Smallest Member of the Rugged Family - with its iconic orange design and secure form factor, the Rugged has been one of our most popular hard drives. With the Rugged Mini, we've shrunk the Rugged, and added tons of new features, making it a solid investment for on-the-go data transport. 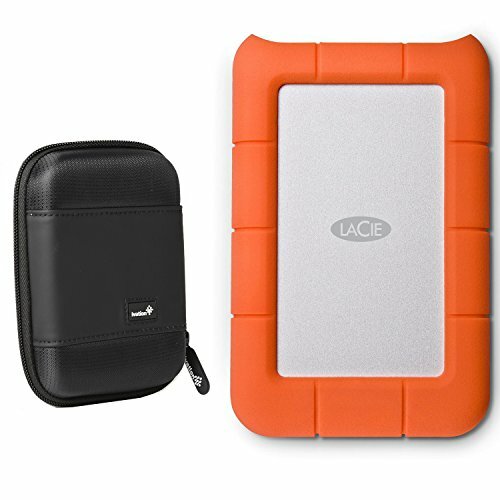 The LaCie Rugged Mini Hard Disk shares features with our popular Rugged Hard Disk, like shock resistance, drop resistance, and a rubber sleeve for added protection. But with the Rugged Mini, we've gone a step further: it's also rain-resistant, and pressure-resistant-you can drive over it with a 1-ton car, and it still works! Its small size makes it perfect to take with you wherever you go, and its Rugged exterior provides protection against accidental drops, shock, or pressure. ♦Inside dimensions: 5.51" x 3.93" x 1.18"
♦Outside dimensions: 6.10" x 4.52"x 1.57"